This one-step disinfectant is effective against a broad-spectrum of bacteria, is virucidal*, inhibits the growth of mold and mildew, including their odors when used as directed. 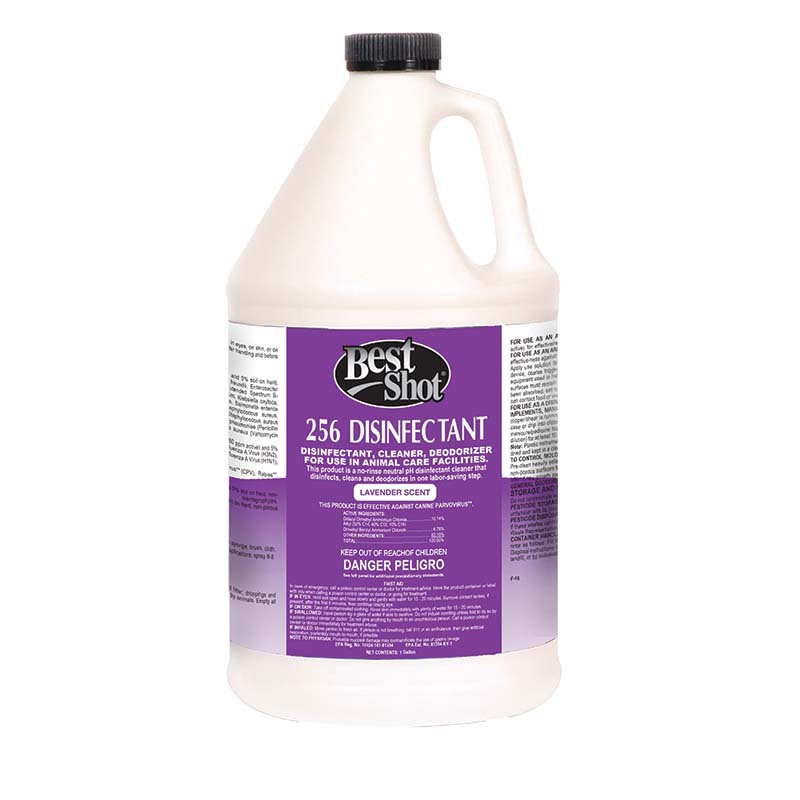 Best Shot 256 Disinfectants are the most current and effective animal care facility disinfectants, cleaners and deodorizers on the market today. Provides area control of Methicillin-resistant Staphylococcus aureus, staph, salmonella, E. coli, bordetella bronchiseptica, canine distemper, feline picornavirus, infectious bovine rhinotracheitis, rabies, pseudorabies, streptococcus-even canine parvovirus! Kills viruses, bacteria, fungi, mold and mildew as they clean, disinfect, and deodorize in one labor-saving step. pH neutral formula disinfects combs, scissors, clipper blades, nail trimmers, tweezers and other grooming/salon tools. *Provides area control of staph, salmonella, E. coli, Methicillin-resistant Staphylococcus aureus, bordetella bronchiseptica, canine distemper, feline picornavirus, infectious bovine rhinotracheitis, rabies, pseudorabies, streptococcus - even canine parvovirus!